In the beginning the heavens and earth were created by God. Arms and the man are being sung by me. Ishmael is what I’m called. Germano doesn’t give us a staid rule for whether or not we ought to use the passive, but shows us why to do so is often ineffective by asking us to draw on our literary and life experience, making us laugh in the process (and surreptitiously helping us see how ridiculous such expressions sound), and then bringing the lesson right home with a frankness that makes you say, “Oh yeah… That’s so obvious!” From Dissertation to Book has a lot of great concrete things you can do to revise your prose. 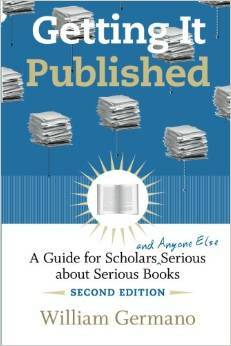 I recommend reading it early on in the process so you can absorb it as you write. It can also be helpful when revising projects beyond the dissertation. 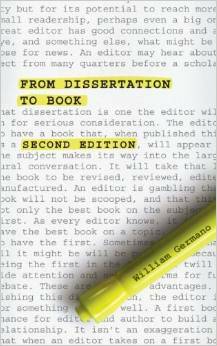 Getting it Published gave me a great insight into the academic publishing industry, everything from what publishers do, to book contracts, to preparing a manuscript, which helped me a great deal when publishing my first book, and continues to help me as I guide other scholars through the process.